I’m a sucker for stripes. Breton, mariner, rugby, those effortlessly cool black-and-white “French” stripes—my closet has ’em all. But this stripe, this perfectly hued olive-and-cream french terry from Girl Charlee has won me over. Sure, the french-terry loops shed A LOT, but the top side is weighty yet soft to the touch. And those colors! So fresh and crisp next to each other. In the words of George Costanza, I would drape myself in this french terry if it were socially acceptable. And I might just be able to do that, since this particular fabric is sold in 72″ widths. Hopefully the leftovers will become a pair of Hudson Pants (or Hudson shorts). 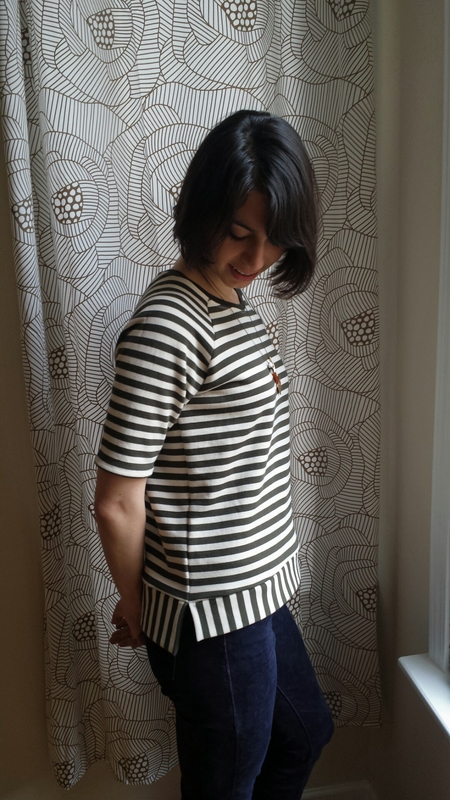 The first garment birthed from this wonder-fabric is view B of the Linden Sweatshirt. This is the fourth Linden I’ve made (some for me, some for my girlfriends), so obviously I dig the pattern. I cut out a 4 rather than an 8, since my first sweatshirt is pretty roomy. I forgot to add extra length on top of the 1″ I’d originally lengthened the pattern, so view B was looking reaaaaal short. 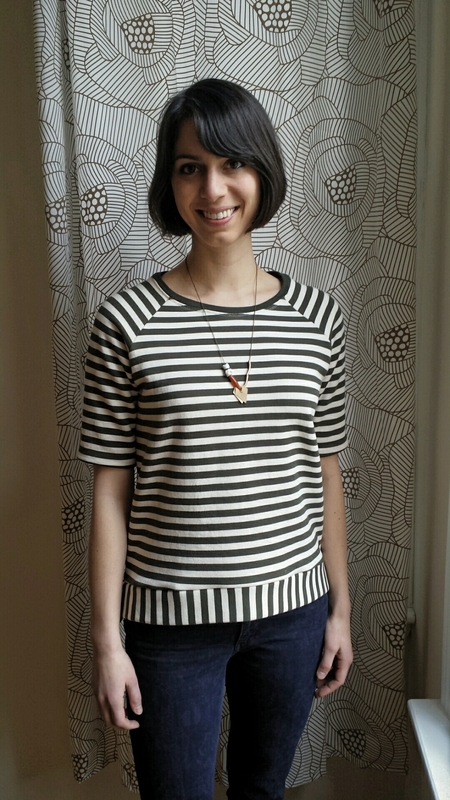 Luckily Jen of Grainline Studio recently published a tutorial on how to make a split-hem Linden—perfect timing as I’d been drooling over some gorgeous split hems on RTW shirts and needed to add some length to my shirt. I’ve never sewn a split hem before, but this one was really easy. Instead of creating one circular band, you sew the ends of each band shut, pin them to the front and back, and then sew them on as if they were one continuous band. For extra security, I backtacked a few times at the connection spot. I took a gamble by cutting the bands vertically, and I’m really happy with the overall look. 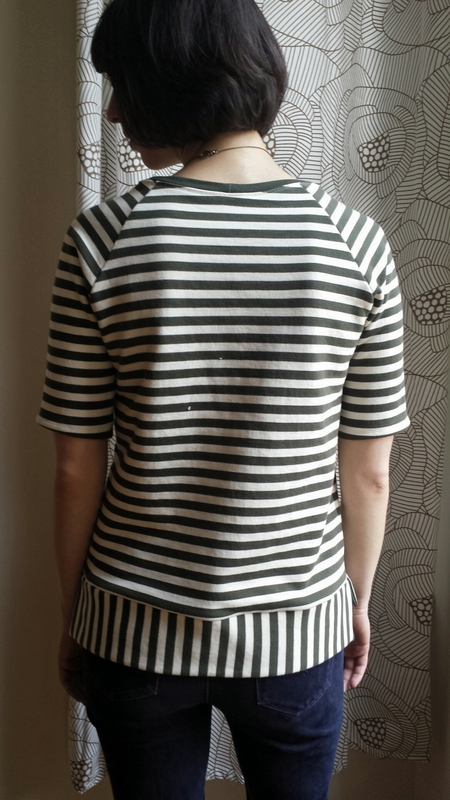 With my first Linden, I made the mistake of trying to use self sweatshirt fabric for the neckband. What. A. Disaster. It didn’t stretch nearly as much as it needed to, resulting in me cutting it off and replacing it with a much stretchier jersey from my stash. This time, I used some olive green cotton-modal-lycra fabric leftover from a skirt I made this past winter, and the neckband went in with nary a hitch. 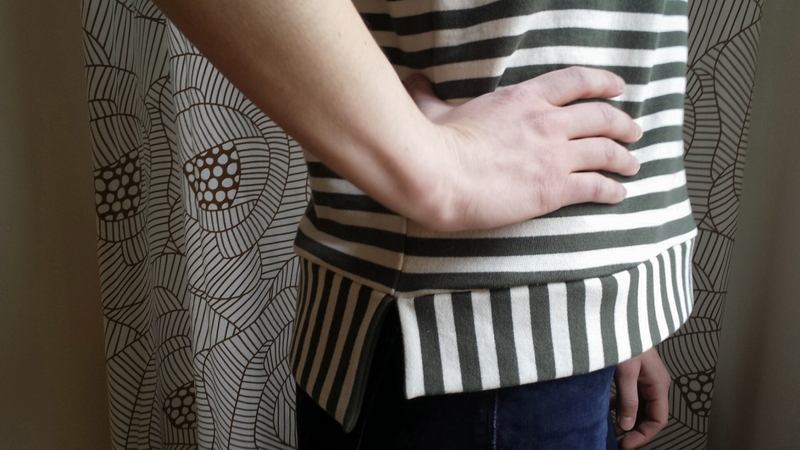 I used a twin needle to anchor the neckband and finish the sleeves. In classic Dani fashion (as my bf likes to say), I splashed orange soup onto my shirt the first night I wore it out. Nothing a little Zout can’t fix, tho! What’s the point of sewing clothes for yourself if you can’t be a slob in them, amirite!? Everything you post looks so terrific! Darling! I can’t wait to make this sweatshirt! Do it! It’s definitely one of the most satisfying patterns in my stash.